A free one-day conference for educators, environmentalists and green businesses interested in sustainable education and activities in the Hudson Valley. Executive Director Jeff Rumpf will present on Green Cities and the Clearwater Center for Environment Justice. 8:45 a.m. - 1:30 p.m.
and Green Chimneys at Clearpool Education Center, a program of Green Chimneys. Native American blessing and visiting birds of prey. Attendees will be provided a continental breakfast, lunch, and networking opportunities. Curriculum samples will be given to each educator who attends. Please register by October 18th. David Amram: The First 80 Years! An eclectic musical celebration of composer & multi-instrumentalist David Amram's 80th Birthday, featuring the 60-piece Queens College Orchestra, Maurice Peress, conductor, Brooklyn Conservatory of Music Jazz Orchestra & Gospel Choir, Earl McIntyre, Renee Manning, film clips, jazz & poetry, world music, special guests & more! Jazz Forum Arts Executive Director Mark Morganelli proudly presents a spectacular, historic celebration of a true American original, whom the Washington Post described as "one of the most versatile and skilled musicians America has ever produced." Featuring the New York premiere of Amram's "Symphonic Variations on a Song by Woody Guthrie" performed in memory of Odetta by the 60-piece Queens College Orchestra conducted by Maurice Peress. The work will be introduced by Nora Guthrie, who commissioned it with support from the Guthrie Foundation, based on her father's song "This Land is Your Land." The evening will also mark the New York premiere of an excerpt from the new DVD of Amram's 1968 comic opera "Twelfth Night" with a libretto by the late Joe Papp, and will be introduced by Bernard Gersten, Executive Producer of the Lincoln Center Theater and former co-producer with Joe Papp of the New York Shakespeare Festival. Selections from Amram's movie soundtracks, including "Splendor in the Grass" (1960), and the New York premiere of a selection from Amram's score for "The Manchurian Candidate" (1962) will be performed by the Brooklyn Conservatory Jazz Ensemble directed by Earl McIntyre. Amram's jazz, Latin, Middle-Eastern and world music compositions will be played in memory of Thelonious Monk. The Brooklyn Conservatory Jazz & Gospel Choirs directed by Renee Manning will also perform. "En memoria de Chano Pozo" for Latin/jazz group and symphony orchestra, conducted by Amram, will be performed in memory of Dizzy Gillespie with guest soloists Candido (congas) and Bobby Sanabria (timbales), with Amram himself on piano, pennywhistles and percussion. The star-studded salute will also include introductions by Amram's friends from the world of theatre, film and music, including actors Keir Dullea ("2001: A Space Odyssey"), John Ventimiglia ("The Sopranos"), Malachy McCourt and performers from the Stella Adler Studio of Acting, as well as filmed 80th birthday wishes from Pete Seeger, Arlo Guthrie, Willie Nelson, members of the N.Y. Philharmonic, and friends and colleagues from around the country. Guest musicians: John McEuen (Nitty Gritty Dirt Band), David Broza, Josh White Jr., Larry Kerwin (Black 47), The Imani Winds, the Amram Family Band and current members and alumni of Amram's quartets from the past 40 years as well as surprise guests. 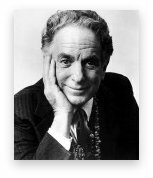 "David Amram: The First 80 Years." Preserving and Protecting the Hudson River. Creating the Next Generation of Environmental Leaders. Clearwater was thrilled to have David Amram as the keynote speaker for this year's Annual Meeting September 19. David's distinguished musical career and influence throughout the world is an inspiring example for our youth, in particular for Clearwater's Power of Song program. "He is a wonderful and empowering elder who sets an enduring example for our Clearwater Family," says Jeff Rumpf, Executive Director. "He is a shining example of the power of song... his music and spirit inspire us all as we work to create the next generation of environmental leaders. Frances Dunwell of the Hudson River Estuary Program of the NYS Department of Environmental Conservation was an honored guest that sunny afternoon. "The job is never done, said Dunwell, "the Hudson River is dynamic, but we will never get to the point where it is fixed. We have made enormous progress, but we face the challenges of 30-year-old sewage plants. What used to be a Federal program is now a loan program, and the out-of-date sewage systems are left to the local governments to fix." Dunwell encouraged Clearwater to continue its efforts to "keep the pressure on" for clean water. Clearwater is fortunate to have such a great partner and look forward to continuing to work with the Hudson River Estuary Program. At our board meeting, eight new members were elected to Clearwater's Board of Directors. Four current Board members were re-elected. This is a diverse and energetic group who are excited to support the organization's mission. New Board Members are William Cox; Francis Cruz; David Fenner, MD; Ron Flax-Davidson; Frank Landsberger, PhD; David Lebson; Roger Meyer; and Alma Rodriquez. Re-elected Board Members are Scott Berwick, Susan Hito-Shapiro, Eric Marshall, and Allan Shope. We would also like to extend our great thanks to outgoing board members Mitchell Bring, David Church and Ann Davis. 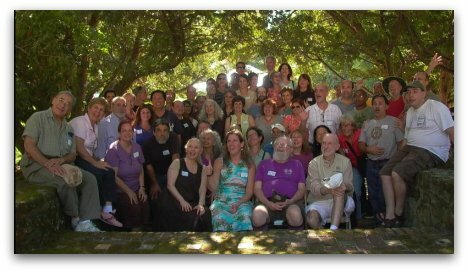 The Walkabout Clearwater Chorus is a chartered member and supporter of the Hudson River Sloop Clearwater The chorus is a true "people's chorus" made up of folks who love to sing and work hard at making good music. and songs by those inspired by him. On September 25, 2010, Clearwater, in a desire to connect with the history of its new home, hosted a reunion for University Settlement of NYC, a fellow youth empowerment organization. Participants from Clearwater's 2010 Youth empowerment programs and alumni from the former University Settlement Camp joined in honoring the past, present and future of youth outdoor environmental education programs in the Hudson Valley, at the former University Settlement Campus - now the new home of Clearwater. Young and old gathered to celebrate memories and accomplishments from both USC's programming, which ended in at the camp in 2007, and from Clearwater's 2010 sloop-based and on-land education programs, such as our Young Women and Young Men at the Helm, and Camp Clearwater. It is fitting that Clearwater would move to a property so well loved and with such a rich history. For almost 100 years, University Settlement operated the camp, providing a haven for New York City children, and an opportunity for thousands to escape urban life and experience nature. This October Clearwater is happy to celebrate our one-year anniversary at the former University Settlement Camp in Beacon, NY, a property located on nearly 100 acres of open space at the foot of Mount Beacon. Across the Middle East, despite great cultural, religious, and political divides, individuals and organizations are coming together to find common ground and friendship on platforms ranging from the environment to music to soccer and so much more. Join with friends in your community and like-minded people around the world for a once-in-a-lifetime gathering to support and celebrate the many cooperative and cross-border efforts between individuals at the grassroots level with the hopes of building a new, sustainable, and better Middle East. Clearwater is proud to be a partner for an innovative global event to promote person-to-person cooperation in the Middle East. An hour-long internet-based group-watching experience hosted by Emmy and Tony Award Winner Mandy Patinkin, With Earth and Each Other will feature celebrities, special musical performances including the legendary Pete Seeger, and segments highlighting many of the wonderful and moving examples of Middle East cooperation. With Earth and Each Other: A Virtual Rally for a Better Middle East is an internet-based event that will be broadcast on Sunday, November 14, 2010 at 1 pm eastern. Organizers expect thousands of people around the world to watch and participate through locally-organized rallies. The rally is being presented by Friends of the Arava Institute (FAI), the U.S.-based organization which supports the ground-breaking Arava Institute. Created in 1996, the Arava Institute is an Israeli-based academic institution bringing together university-level students including Israelis, Palestinians, and Jordanians to study environmental issues in order to advance regional sustainability and build trans-boundary cooperation. Events are being planned in locations including New York, San Francisco, St. Louis, Atlanta, Philadelphia, and Vancouver, as well as in the Middle East. Information on hosting rally-watching events can be found on the event website, www.withearthandeachother.org. Hudson River Sloop Clearwater will receive the 2010 Dutchess County Executive's Arts Awards for"Art in Public Places as a "floating icon of the Hudson River Valley, sharing music and the arts with thousands of residents and visitors each year through the Great Hudson River Revival." The event will take place on October 25 at The Grandview in Poughkeepsie. Clearwater will be recognized by Dutchess County Executive William R. Steinhaus, members of the Dutchess County Arts Council, and civic leaders during the dinner ceremony. Jeff Rumpf, Executive Director, will accept the award on behalf of Hudson River Sloop Clearwater. The Arts Council is very pleased to be recognizing Clearwater for their artistic achievements. It seems like music and singing is woven into the very fibers of theClearwater's sails. Through their festivals and other programs they have engaged thousands of folks in environmental causes through music and other arts. 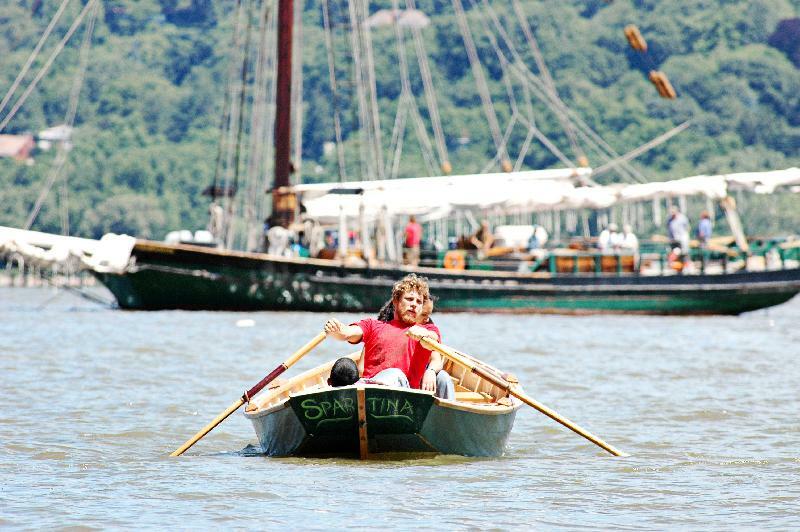 Here at the Dutchess County Arts Council, we know that the arts can save the world, Hudson River Sloop Clearwater demonstrates how that actually happens. Kudos to Pete, Jeff, and the whole crew! Onward! 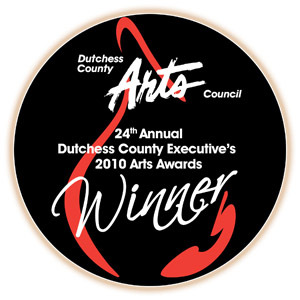 Please visit the Dutchess County Arts Council website at www.artsmidhudson.org for more information. Ristorante Caterina de' Medici at the The Culinary Institute of America, the world's premier culinary college. Dinner and Dancing with The Big Band Sound. sailing on the Hudson River. The print is 28.5" x 22", suitable for framing, and a wonderful gift. Now available for $27.00, or 40% off the original price! or call 845 265-8080, 7119. Join fellow Clearwater members for a day of inspiring speakers and music at this year's Annual Meeting! This year's theme for Annual Meeting is Activating the Next Generation of Cause Musicians. 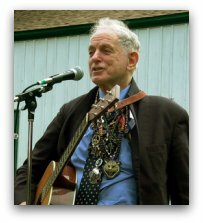 David Amram, composer, musician, conductor, writer, and friend of Clearwater is our Keynote speaker and will present a musical conversation with help from Linda Richards and the Power of Song students. The Walkabout Clearwater Chorus will also perform. This event is free and open to the public. Breakfast will be served at 8:30 that morning and followed by meeting. We invite you to stay the afternoon and enjoy the area as we hold our annual meeting for the first time since moving here at our new headquarters in Beacon, NY. The sloopClearwater will be docked at the Beacon waterfront with deck tours from 11-2:30 pm. Please RSVP by September 10th to Heidi Thorn if you plan to attend at 845 265-8080, x7101, or e-mail Heidi at office@clearwater.org. If you will be traveling by Metro-North Railroad, please reserve a spot for yourself for shuttle transportation to and from the Beacon train station. For more information about the Clearwater's 2010 Annual Meeting, click here. Bring your school, after-school program or group of friends out for an inspiring and educational sail aboard the sloop Clearwater. Now scheduling for April, May, and June, 2011." Click here for Guidelines for applying. The deadline for first-round applications is October 15th, 2010. Detailed information about our pioneering onboard education programs- including curriculum options and program overviews- can be found by clicking here. Meanwhile, the 2010 Clearwater Sailing Season is coming to a close. Book your fall Group Sail today! Click here to see the Fall 2010 Sailing Schedule and find out where Clearwater is sailing this September and October. For more information, please contact Catherine Stankowski, Sail Coordinator at 845-265-8080, x7107, or e-mail Catherine at catherine@clearwater.org to schedule your group sail. Or visit our website at www.clearwater.org/come-sailing for more information. Come explore the Hudson River Estuary and follow the path of the water as it enters the estuary. We will take a moderate hike through the preserve discussing how water has shaped the landscape while examining the flora and fauna. This will be followed by a beach seine program. We will don chest waders to catch, examine, and identify fish. The Esopus Meadows Walk and Wade is fun and informative for all ages. Program duration is 2 hours. protect the Hudson River ecology and the well-being of people living in its watershed, the Rondout Creek Watershed Council and Hudson Basin River Watch will be hosting their second Annual Fall Stream Monitoring Days for the entire Rosendale Elementary School 4th grade class. In Mid-September, over a 2-day period, students will visit the Epworth Camp and Retreat Center in High Falls, New York to measure the health of the Rondout Creek. We will collect live organisms from the creek and learn how to analyze them as indicators of water quality. This event is offered as part of the first Ulster County-wide Creek Week dedicated to watershed education. For information about this and other watershed initiatives please contact Victor-Pierre Melendez, RCWC Coordinator at 845-265-8080 x7144 or email victor@clearwater.org. Clearwater's Power of Song - Now Playing! Saturday, October 2nd. Visit www.walkway.org for more details as they develop. As part of a community-based environmental justice project, Clearwater has revised our 1993 Angler Survey and is interviewing fisherman along the waterfront from Verplanck to Annsville Creek. The goal of this survey is to assess whether or not they or their family are eating fish and if they are aware of the health advisories related to Hudson River fish due to PCBs, mercury and other contamination. Since this past May, our wonderful team of volunteers have been interviewing local anglers - and having a great time doing so! We need to complete 150 interviews to assure that the survey is statistically valid. To reach this goal, Clearwater needs volunteer surveyors from Westchester, Putnam and Rockland counties (or beyond if you are willing). Training will be provided on Tuesday, September 14 at 6:30 pm, at the Bean RunnerCafe in Peekskill. Bilingual volunteers are especially welcome. We also have some great volunteer events coming up in the next two months. Sign up to come in to the Clearwater office during the week to help out with various projects. On Sunday, September 12 we will have a volunteer work day from 1:00 PM -5:00PM. We will be preparing the office and the grounds for Annual Meeting and continuing the work on our gardens. Click here to sign up. Small projects inside and out will be available for all ages and skills. On Saturday, October 2 we will have another volunteer work day from 11:00 AM - 4:00 PM. This day we will be preparing the office for the colder months and working on various touch up and repair projects, as well as any need work getting the gardens ready for the winter. Click here to sign up. Please contact Johnathan Wright, Volunteer Coordinator if you would like to volunteer for one of these projects or if you can work in the office during the week or would like to discuss other volunteer opportunities. Send Johnathan an email with your availability at volcoord@clearwater.org, or or call him at (845) 265-8080, ext. 7102. Thank you all for your support and hard work for Clearwater. 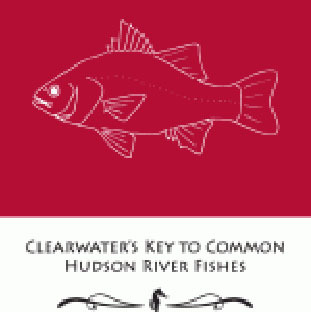 Clearwater's Key to Common Hudson River Fishes has been updated and reprinted and is now available! The new edition comes beautifully redesigned and printed on durable waterproof paper and updated information. The Clearwater Fish Key was created to identify the species of fish most likely to be encountered in the Hudson River estuary by anglers, students, educators, researchers and the general public. This guide is easy to use and provides a systematic tool that introduces students to scientific identification methods. Price is $20, or $15 for students, teachers, educators and Clearwater members. Click here to visit Clearwater's online store to purchase! 7 stages with live music and performance artists! It's a pleasure and honor to be Director of Clearwater's Great Hudson River Revival for 2010. I've been working very hard with our great team including assistant director Will Solomon, the Clearwater Staff and the Revival Planning Committee to produce a festival that's fun, inspiring and raises money for a wonderful organization. The Revival is a fundraiser for Hudson River Sloop Clearwater held at Croton Point Park, Croton-on-Hudson, NY, and is also the country's oldest music and environmental festival. The revenue raised by the Revival goes to support Clearwater's numerous educational programs and its work toward environmental and social justice-as well as keeping the sloop Clearwater afloat. For the 2010 incarnation of the Revival, we are looking to draw upon the greatness of the past while looking toward the future. 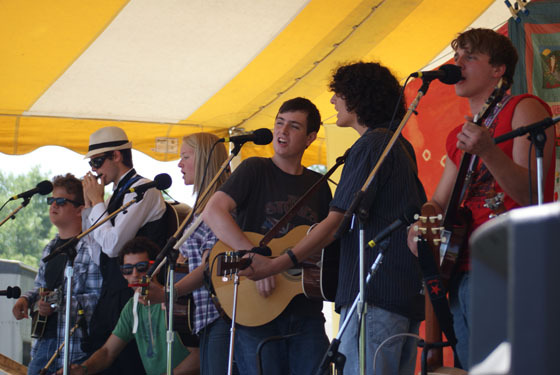 We are returning to the 2008 model of the Rainbow Stage as our main stage and the Hudson as our secondary stage. 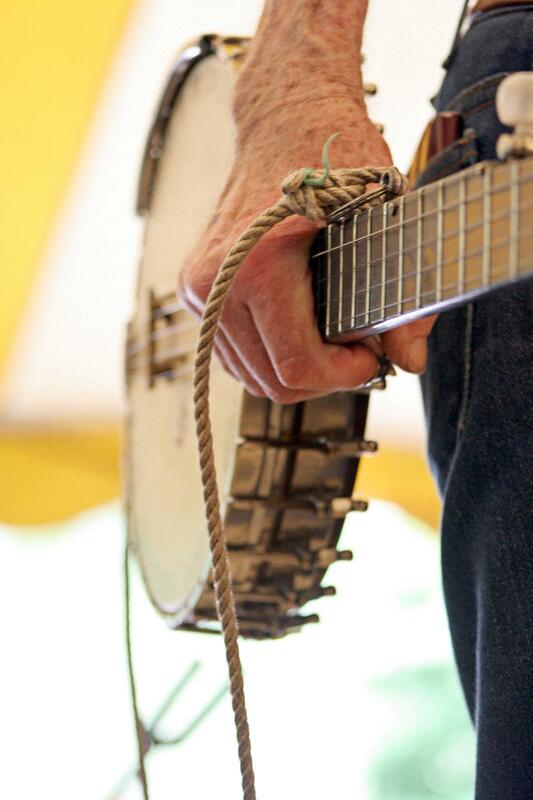 Pete Seeger & the Power of Song gets us underway on Saturday, June 19 on the Rainbow Stage. Also featured on this stage throughout the weekend are famed singer-songwriters Steve Earle and Shawn Colvin, contemporary music star Joan Osborne,Westchester County nativeDavid Bromberg and his quartet, Keller Williams, "newgrass" sensationRailroad Earth, Donna the Buffalo, Toshi Reagon, The Felice Brothers, sacred steel guitar family band The Lee Boys, and Hazmat Modine, a global blues band based in NYC. Appearing on the Hudson Stage will be Steve Forbert, Rhett Miller(from the Old 97s), Mike Doughty, Angel Band, Dan Bern, Lucy Kaplansky, Jonatha Brooke, Canadian duo Dala, Milton, David Amram, Sara Watkins(from Nickel Creek), Sarah Lee Guthrie & Johnny Irion and the Tao Seeger Band. Get your groove on at renamed World Dance Stage with a bigger dance floor and bands from around the globe. The diverse roster features many different dance music styles and wonderful artists including Zydeco greats Buckwheat Zydecoand C.J. Chenier & the Red Hot Louisiana Band, Quebecois Cajun group Le Vent du Nord, Celtic artist, fiddle player of Riverdance and Rockland county resident Eileen Ivers, Contra Dance bands Nightingale and Jay, Molly & Peter, Eastern European brass band Slavic Soul Party, Haitian drumming and dance ensembleBonga & The Vodou Drums of Haiti, Westchester based Columbian folkloric dance band Folklore Urbano; West African Balafon troupeKakande and from New Orleans, The Subdudes and funk-soul bandBrother Joscephus & the Love Revival Revolution Orchestra. We are also adding a new stage called the Sloop Stage that will present diverse, grass-roots based artists during the weekend. The Sloop Stage will be located on the North Field. Our next newsletter will feature the line-up for this stage. As always there will be plenty of family oriented programming including the Family Stage, juggling, roving artists, face painting plus lots of other activities and vendors for kids. Appearing on the Family Stage will bePete Seeger & Tomorrow's Children, Sarah Lee Guthrie & Johnny Irion, David Amram, Elizabeth Mitchell & You Are My Flower, Kim & Reggie Harris, Jay Mankita, Grenadilla, Nancy Tucker, Roger the Jester, Dog on Fleas, Uncle Rock, Linda Richards and Dan Einbender. The Revival is full of unique experiences. Story Grove, with professional storytellers and Circle of Song (audience participatory singing) keeps alive these unique and long-standing traditions. Performers at Story Grove include The Storycrafters, Dave Conover, Robert DeMayo, Bob Reiser, Nancy Marie Payne, Anne Shapiro & Tom Callinan and Bobaloo Basey. At Circle of Song we have Marva P. Clarke and Kim Harris leading gospel sings, the Dirty Stay Out Skifflers, the Edukated Fleas, Hope Machine, Captain Killian & Crew, Mel & Vinnie, Eric Russell, Evy Mayer, Steve Stanne, Stout and Matt Turk. Other programming that sets Clearwater apart from other festivals include Arm-of-the-Sea Theater (mask and puppet theater), the Rude Mechanical Orchestra (30-odd-piece New York City radical marching band and dance troupe), the Walkabout Clearwater Chorus(celebrating their 25th anniversary in 2010) and more. Returning to their 2008 locations are the Juried Crafts Fair with over 40 exhibitors/vendors, the Green Living Expo Tent, Activist Area and other field programs located on the South Field. The Discovery and Tideline Tents will feature Clearwater's original hands-on environmental education programs and Hudson River research.The Environmental Action Tent will highlight Clearwater's watershed and environmental justice initiatives in cities up and down the Hudson River Valley. The sloop Clearwater and the schooner Mystic Whaler will be conducting sails and deck tours throughout the weekend. Sail reservations on both boats are currently available on the festival website. Keeping with tradition, the entire festival is wheelchair accessible and most stage programming is staffed with American Sign Language interpreters. Tickets for the Revival are available at www.ClearwaterFestival.orgor 845-418-3596. The "early bird" period ends on May 16 so make sure to buy early and save money! I look forward to seeing you in June. It's been a long winter and we are excited to invite you to join us for our very first sail of the season. This is a rare opportunity to experience both shores of the river while celebrating a quintessential Hudson River event: The migration of the American Shad! Clearwater- in collaboration with Beczak Environmental Education Center, Greenbrook Sanctuary, and the historic Kearney House- is hosting a Ship to Shore Shad Bake on Saturday, May 1st, 2010 from 10:00am to 3:30pm. The day begins in Yonkers at Beczak with an hour of river education and fish identification, followed by a two-hour sail aboard sloop Clearwater. The sloop will arrive at the Alpine Boat Basin in time for passengers to attend the historic Kearney House's Shad Bake. Note that, due to the recent ban on shad fishing, shad will not be served, although other fish will be available for sampling, and other foods will be available for purchase. The day ends with passengers again boarding the sloop and being returned to Yonkers. The cost of this event is $55/adult, $40/Clearwater members, and $20/children 12 years of age and younger. To ensure your spot, please make your reservation by calling Catherine Stankowski at 845-265-8080, ext 7107, by April 30th. The Beczak Environmental Education Center is located at 35 Alexander Street in Yonkers, NY, one block north of the Yonkers train station. We want to let you know that New York State is considering a plan to close the Walkway State Historic Park (and other state parks and historic sites) from December through March and at least two days each week after that. This comes after the Walkway has become, in just six months since opening, New York's third most popular park with nearly half a million visitors. We think this would be a shortsighted attempt to save what amounts to pennies compared to the state's enormous budget while possibly losing significant tourism revenue and the state taxes they generate. In addition, closing the Walkway would take away an important source ofhealthy recreational entertainment, free of charge, for hundreds of thousands at a time when it is desperately needed. Please help us by joining the campaign to Keep the Walkway Open. Go to the Walkway's our Facebook page:www.facebook.com/keepwalkwayopen and join as a fan. You can also check out ways to tell the New York State that this would be a very bad idea. With your help we can Keep the Walkway Open! Want a unique experience on the Hudson River? Then set sail with sloop Clearwater-the flagship of America's environmental movement. Hudson River Sloop Clearwater is pleased to announce its summer and public sailing schedules, which can be found onlinehere (summer sail schedule is at the bottom of the page) and here (for public sail schedule). The summer schedule for July and August is now available for perusal and bookings. The sloop Clearwater will start the sailing season with a "Ship to Shore Shad Bake" that will take passengers from Yonkers to the Kearney House in Alpine, NJ on Saturday, May 1, 2010. This Shad Bake is being held in conjunction with the Beczak Environmental Education Center, Greenburgh Sanctuary and Palisades Interstate Park Commission. (Note: No shad will be served at the event due the recent ban on shad fishing, but other fish will be available for sampling.) The schooner Mystic Whaler, which is contracted out to run Clearwater's educational and public sail programs, begins its public sail season in New York City at the West 79th Street Boat Basin on Saturday, April 17, 2010. Both vessels will be offering public sails at Clearwater's Great Hudson River Revival on Saturday and Sunday, June 19 and 20 at Croton Point Park, Croton-on-Hudson, NY. It should be noted that the sloop Clearwater is returning to the Red Hook dock in Brooklyn, NY during the second week of May. Last year, Clearwater began docking regularly in Brooklyn, much to the delight of residents, educators and students there. Many weekend dates are presently open on both the Clearwater and Mystic Whalerschedules. Those interested in chartering either vessel for a group sail or a private event are now able to view available dates. Contact Catherine Stankowski, Clearwater's sail coordinator, at (845) 265-8080 x7107 or by email sailcoord@clearwater.org for more information or to book a sail. "Public sails are a great way for individuals and families to experience their river," said Stankowski. "We're excited to offer a number of public sails from the Albany region down to Brooklyn in 2010." Small groups bookings also available. 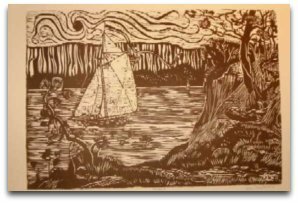 So, make plans now to stand beside the crew of an authentic tall ship and learn more about the Hudson, its place in American history and how a grassroots group of volunteers fought against the pollution of our natural resources. All 3-hour sails cast off and return to the same dock. Applications Now Open For Onboard Volunteers! The hillsides in the Hudson Valley are covered with snow, but Hudson River Sloop Clearwater, America's flagship environmental organization, is looking ahead to the spring sailing schedule and bringing new volunteers on board to help with its award-winning educational programs. What better way to welcome in the warmer weather than by spending a week sailing aboard the majestic Hudson River sloopClearwater or her sister ship, the schooner Mystic Whaler? Clearwater is welcoming applications now for anyone interested in experiencing life aboard an historic tall ship, who is willing to work hard and above all has a passion for teaching. Each week, Clearwater supplements her professional crew with six new volunteers who help sail the vessel and assist in teaching her prestigious education program. As volunteers, individuals can expect three fantastic meals a day, exciting adventures on the water, the chance to teach hundreds of kids, a slightly uncomfortable bunk and the sweet satisfaction of working together for a wonderful cause. Clearwater relies on the support of volunteers to help prepare the next generation of environmental leaders by inspiring students to learn about and love our Hudson River. For more information and volunteer applications click here and visit our volunteer page. See you on the river! What an amazing year 2009 was for Clearwater! Our sailing season was filled to the brim with inspiring education programs and special Quadricentennial events. With the help of many volunteers, we "revamped the camp" and relocated to our beautiful new offices in Beacon. And we are now busy with an extensive restoration on the bow of the sloop Clearwater. None of this would have been possible without the enormous support from Clearwater members and volunteers--and we'd like to thank you with a PARTY! Bring your family and friends to see the sloop restoration work in action. It is a rare opportunity to see Clearwater out of the water and in all her glory. And throughout the year, selling merchandise, passing out flyers, singing songs and spreading the word. What will you find when you come to Lynch's Marina? And folks with musical instruments ready for a classic Clearwater jam session. All are welcome to join in! Please remember: it will be cold at Lynch's Marina in January, so please dress warmly. Click here to RSVP, so that we know how many to plan for. If you have any questions, please email Jonathan atvolcoord@clearwater.org. Can't come? Don't worry, just save the date of February 27 for our next event at Lynch's Marina! Thank you for your support and dedication to Clearwater. Let's build a great year together! The Hudson is measured north from Hudson River Mile 0 at the Battery at the southern tip of Manhattan. The George Washington Bridge is at HRM 12, the Tappan Zee 28, Bear Mountain 47, Beacon-Newburgh 62, Mid-Hudson 75, Kingston-Rhinecliff 95, Rip Van Winkle 114, and the Federal Dam at Troy, the head of tidewater, at 153. Entries from points east and west in the watershed reference the corresponding river mile on the mainstem. An organization representing thirty-three boat clubs, on both sides of the Hudson. Over 8,000 members from Poughkeepsie to below Yonkers.